It was the awkward moment heard &apos;round the world. Earlier this month, Nicole Kidman appeared on The Tonight Show with Jimmy Fallon and had a cringe-worthy conversation, informing Fallon that they once went on a date — except Fallon didn&apos;t realize it was a date, or that the stunning Oscar winner was interested. 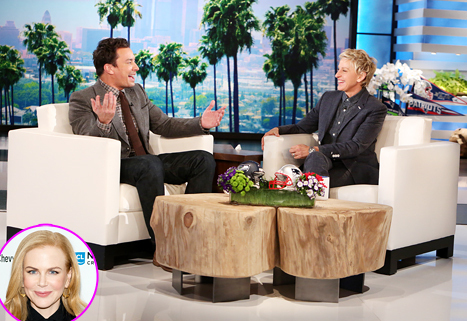 Appearing gobsmacked at the time on his show, Fallon, 40, stopped by The Ellen DeGeneres Show on Friday, Jan. 30, and dished on the Tonight Show encounter with Kidman, 47, and that fateful introduction years back. "My friend calls me and said, &apos;Dude, what are you doing?&apos; I go, &apos;I&apos;m walking home,&apos;" Fallon began to Ellen DeGeneres about the day he met Kidman. "This was 2002, I want to say… right before I met my wife in 2004. So 2002, I&apos;m single, but I don&apos;t think about this remotely, my chances of dating [Kidman]. I think she was named most beautiful person that year! So this is beyond my understanding. My friend calls, says &apos;I have Nicole Kidman with me. She wants to meet you and I think it&apos;s about a movie.&apos; — Bewitched, she was about to make," he recounted of Kidman, who had divorced Tom Cruise the year prior. "So I go, &apos;Okay, great. Where do you want to meet?&apos;" the Tonight Show host continued. "He goes, &apos;We&apos;ll come to your apartment.&apos; I go, &apos;You&apos;re gonna bring Nicole Kidman to my apartment?… What do we have, what do we put out? I don&apos;t know what to do.&apos; So my friend goes, &apos;Go get some cheese and crackers.&apos; I go, &apos;Cheese and crackers?&apos; I mean, I&apos;m seriously living the bachelor life. I have sneakers and video games all over my house. So I go, &apos;What kind of cheese?&apos; I&apos;m walking into a deli and he goes, &apos;Some brie or something.&apos; I go, &apos;What is brie cheese? I don&apos;t even know what that is!&apos;"
In his late 20s in 2002, Fallon was living in New York City and starring in Saturday Night Live at the time. He had booked one role in a feature film — 2000&apos;s Almost Famous — and would go on to pursue a movie career in the ensuing years before transitioning to his work on Late Night and The Tonight Show. "So I&apos;m going and I go &apos;Do you have brie cheese?&apos;" Fallon continued in his tale of meeting Kidman. "I really don&apos;t really know what that is. So I go to the aisle, I get brie cheese and saltine crackers. I don&apos;t know anything about cheese and crackers, I don&apos;t even have a cracker plate so I put the cheese on a normal dinner plate and I have the saltines — I&apos;ll never forget this — I peeled it back almost like a disco &apos;70s shirt where you just… I peeled it back so it was kind of a little showy, a little glamorous… still in the sleeve, but I feathered out the crackers so it was classy." Fallon&apos;s cheese and crackers presentation may not have been classy enough, as it resulted in neither a movie role for the comedian nor a second date with Kidman. Fallon seemed not to dwell on the incident for years, until Tuesday, Jan. 6, when the Queen of the Desert actress gave him an interview. "So Nicole Kidman&apos;s coming on my show and I call my friend and I go, &apos;Dude, Nicole Kidman&apos;s coming on. Remember when you brought her to my house and I was so embarrassed?&apos;" Fallon explained. "He goes &apos;Yeah, yeah it&apos;ll be fun, tell her I said hi. She&apos;s so nice.&apos; [She] comes on, I&apos;m telling this story just like this and she goes &apos;But the reason why I was there wasn&apos;t because I wanted you for the movie.&apos; I go, &apos;Huh?&apos; She goes &apos;No, I liked you.&apos;"
"I was like, &apos;Wait, what happened? Are you saying that we basically almost… we went on a date?&apos;" Fallon continued. "Then she goes, &apos;Yeah, it was terrible.&apos; I&apos;m starting to get red because I was ready to tell my embarrassing story, but then it got a little bit too real. She&apos;s like &apos;Then you started playing video games.&apos; Alright, now you&apos;re getting a little to close to the bone." After their failed romance, both Fallon and Kidman went on to find love. The SNL alum married filmmaker Nancy Juvonen in 2007, and welcomed daughters Winnie and Frances in 2013 and 2014, respectively. For her part, Kidman met country singer Keith Urban soon after and married him in 2006. They are the parents to daughters Sunday, 6, and Faith, 4. "It all worked out," Fallon said. "She&apos;s obviously happy with Keith Urban and I lucked out I have the best wife in the whole wide world."